I am a sucker for unique architecture and the underground houses definitely fit into that category; each a wonder of its own merit and each a little more stunning than the last. I’ve ranked these houses in order of my own personal preference, number one being the home I’d most like to live in myself and number five being the one I could least likely see myself living in. That isn’t to say one house is better than the others or one isn’t as impressive as the others. 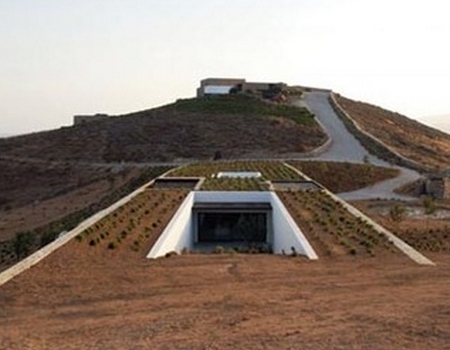 These underground houses are each stunning in their own ways. Let’s take a look. Now I have to be honest. This house is a little too ‘contemporary’ for my tastes but it certainly is a marvel all the same. The real beauty of this home lies in the fact that it has been designed in such a way that the home blends in nearly perfectly with its surroundings. Inside the home, you basically have one large room that is sectioned off into brightly colored pods that denote certain areas (the kitchen, bathroom etc). It features all of the modern amenities without losing its unique feel. Whether or not I’d want to live there is more or less irrelevant. It’s a beautiful, breathtaking structure that has been beautifully designed and executed. It’s no small wonder that Malator is often referred to as one of Wales’ architectural masterpieces. 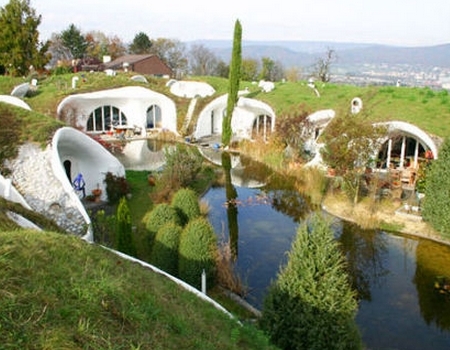 The Hobbit House, designed by SeArch and Christian Müller Architects, easily earned its place on this list of underground houses that must be seen to be believed. Vals is, of course, famous for its thermal baths and its stunning mountain views and this home takes advantage of both of those things. Situated close to the baths, the house in built in such a way that it is able to take advantage of the close proximity to the baths without sacrificing the mountain view. The ground also offers excellent natural insulation making sure this home costs almost nothing to heat in the winter and keeping it cool in the summer. This is one of the underground houses on our list that can boast being almost completely underground while still offering a stunning view and plenty of natural light. 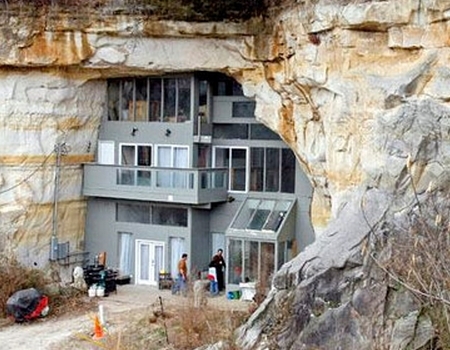 When it comes to underground houses, The Cave House is one of the first that comes to mind for me. This house is an absolute treasure. Before becoming a home, the sandstone cave was previously used as a concert venue that played host to musicians like Ted Nugent, Bob Seger and Tina Turner. I would’ve paid to see two out of those three shows. I won’t specify which ones. It was also formerly used as a roller skating rink. All that changed though when Curt and Deborah Sleeper purchased the parcel of land the sandstone cave sits on and realized they envisioned something much different for that cave. They looked at it and saw a new home. More than it’s beauty though, this home offers geothermal heating which effectively eliminates the need for a furnace in the winter or air conditioning in the summer. The benefits for the wallet and for the environment there should be fairly obvious. That isn’t to say the beauty isn’t a spectacular benefit on its own. Just take a look at that photo above. When designing the home, the Sleepers chose to leave many of the interior walls exposed so the natural beauty of the cave wouldn’t be lost on those inside the home. There were a few issues though; the biggest being the way the walls shed sand. The Sleepers tackled the problem by installing interior roofs and protective covering on any areas that must stay sand free. Here’s what I love about this house. It strikes the perfect balance between the natural and the artificial. The inside of the home, which was designed by Deca, is warm and inviting, offering all of the modern amenities, while the exterior just sort of blends in with its beautiful surroundings. Inside, there are five interior areas which are separated by four courtyards that have almost been carved in the landscape itself. The courtyards aren’t just an aesthetic design feature though. They also serve a purpose; bringing in that much desired natural light and protecting the home from the elements. While it may seem as if the arid desert of Greece may not make the ideal location for a home, this one proves that things aren’t always what they seem. The cross winds take care of most of your heating and cooling needs while the design of the structure offers terrific natural light. The real beauty of this home, though, lies in the fact that it’s just so unassuming and subtle. Only the center of the home is visible above ground and even then it looks like little more than the buried remnants of some ancient civilization. Everything about this home feels natural and beautiful which is what makes it work so incredibly well. 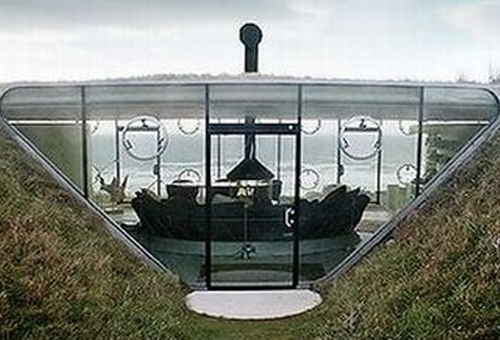 If it weren’t for the next underground house on our list, this one would easily be the winner for me. 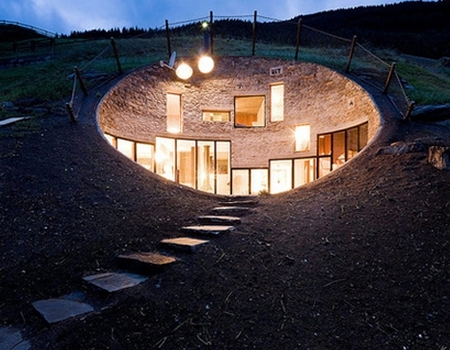 Definitely one of the finest examples of underground houses out there. Sometimes referred to as “The Hidden Estate”, this settlement is easily one of my favorite underground houses. It is just absolutely stunning. There is no other word for it. This estate, designed by Vetsch Architektur, features nine separate houses (3 three bedroom houses, 1 four bedroom house, 1 five bedroom house, 3 six bedroom houses and 1 seven bedroom house) situated around an artificial lake. The settlement also includes a section of free agricultural land and each unit has its own outdoor living space and lots of natural light. The earth surrounding the houses keeps the temperature comfortable and also protects the homes from water, extreme weather and wind. You can even grow grass or pants on the rooftop. For me, this is easily the winner out of all the underground houses we’ve talked about as it’s the one I would most like to live in. It’s an absolute dream. Have never fathomed why We don,t have more below the ground homes. Multiple advantages and no problems that can,t be remedied given a bit more time and experience.The Romans built fantastic below ground homes in Northern Africa 2000 years ago.With todays energy problems mabey it,s time We took a closer look at this option.